You are here: Home / News / Crosby Steele & Etheridge - One Night Only! Crosby Steele & Etheridge - One Night Only! 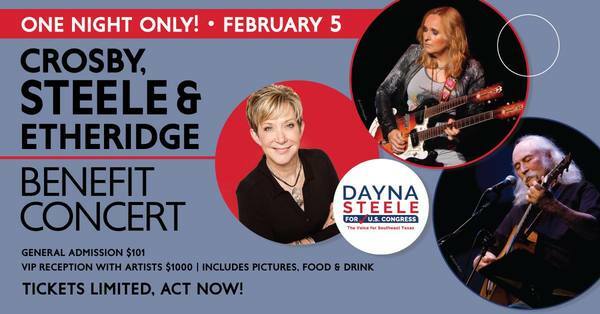 A rare opportunity for you to see Grammy winning rocker Melissa Etheridge along with Rock Hall of Fame legend David Crosby of Crosby Stills & Nash together in an intimate club setting in Clear Lake/Houston raising money for their friend Dayna Steele running for Congress.